Bath Lane This area outside the West Walls of the old town was known as the Warden's Close. According to the 17th century Newcastle historian, Gray, the Warden's Close formerly contained the house and gardens of the Warden of Tynemouth Priory. Near here in 1767, the town's first local public asylum for pauper lunatics was built. It was an institution of unremitting barbarity until it was taken over by the Corporation in 1824. In 1804 a fever hospital was built between the asylum and the Town Wall. This was built for the "infected poor" struck by typhus, a disease prevalent in the area in the first half of the 19th century. Even in the period from 1855 to 1873 there were still 230 cases of the disease being admitted to the hospital each year. The "House of Recovery", as it was known, closed when the City Hospital for Infectious Diseases in Walkergate opened in 1888. For many years the House of Recovery stood in the grounds of what became Rutherford College. This educational establishment began life as Bath Lane School and was founded by Dr. Rutherford in 1870. It was demolished in 1987. Beyond the marker is Morden Tower, part of the city wall. from the former Public Medical Baths which stood near the Fever Hospital. 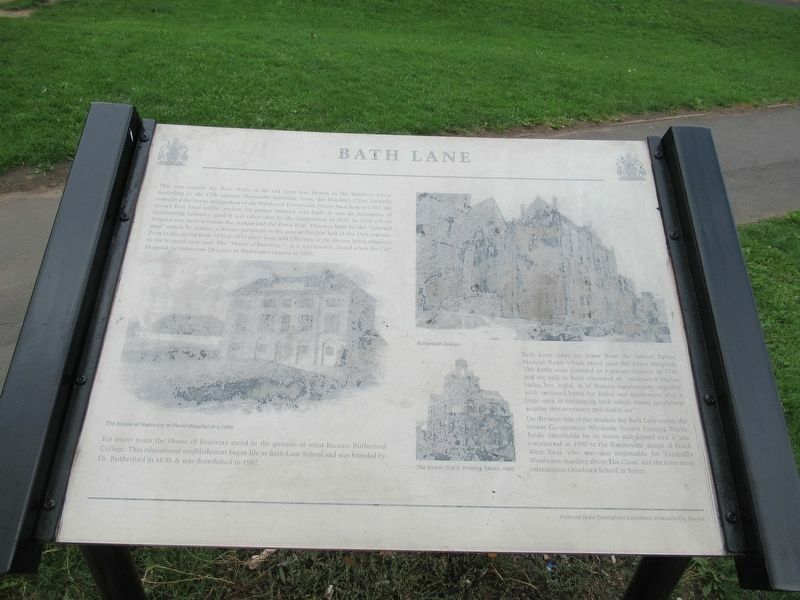 The Baths were founded as a private venture in 1781 and are said to have consisted of "medicated vapour baths, hot, tepid, or of Buxton temperature, together with enclosed baths for ladies and gentlemen, also a large open or swimming bath where young gentlemen acquire this necessary and useful art". On the west side of the modern day Bath Lane stands the former Co-operative Wholesale Society Printing Works. Easily identifiable by its tower and domed roof it was constructed in 1890 to the flamboyant design of Frank West Rich, who was also responsible for Turnbull's Warehouse standing above The Close, and the even more ostentatious Ouseburn School in Byker. Erected by the Development Department, Newcastle City Council. Location. 54° 58.296′ N, 1° 37.283′ W. Marker is in Newcastle upon Tyne, England, in Northumberland. Marker is at the intersection of Bath Lane and Stowell Street, on the right when traveling north on Bath Lane. Touch for map. Marker is at or near this postal address: 41 Bath Lane, Newcastle upon Tyne, England NE4 5SP, United Kingdom. Touch for directions. Other nearby markers. At least 8 other markers are within walking distance of this marker. 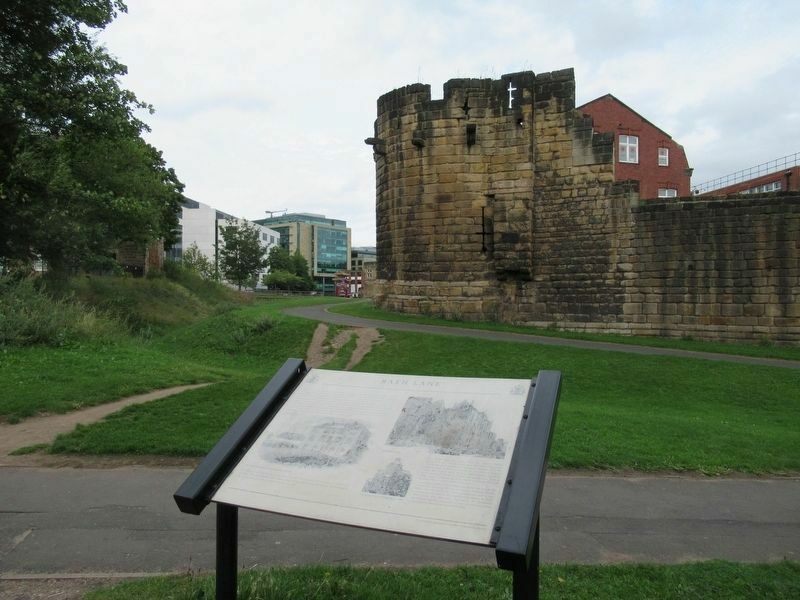 The Town Wall (within shouting distance of this marker); West Walls (within shouting distance of this marker); Gallowgate Lead Works (about 120 meters away, measured in a direct line); Ever Tower (about 210 meters away); 28 Clayton Street West (approx. 0.3 kilometers away); 36 Clayton Street West (approx. 0.3 kilometers away); Thomas Bewick (approx. 0.3 kilometers away); Basil Hume Memorial Garden (approx. 0.3 kilometers away). Touch for a list and map of all markers in Newcastle upon Tyne. More. Search the internet for Bath Lane. Credits. This page was last revised on November 18, 2018. This page originally submitted on November 18, 2018, by Michael Herrick of Southbury, Connecticut. This page has been viewed 40 times since then and 3 times this year. Photos: 1, 2. submitted on November 18, 2018, by Michael Herrick of Southbury, Connecticut.